There is an old African saying (I think it originated in the Kikuyu tribe though there are variants of it) that when elephants fight it is the grass that is trampled. It is simple enough to understand. When beasts the size of pachyderms fight it is the small animals inadvertently caught up in the tussle and the grass on which they fight that suffer the most. Those engaged in the current gladiatorial contests are not the four-legged kind that gave rise to the African proverb. They are two-legged politicians vying for power and influence over their colleagues in the same party whose symbol is the elephant. In doing so they have no compunctions about slating each other publicly via the media which become the ‘fall guy’ when the guns are turned on the self-same politicians. While these big beasts are easily identifiable because of their public dog fights, there are those from the private sector who have inveigled themselves into political office through an old boy’s network of no proven ability and have injected into the system an arrogant culture of corporate secrecy that systematically undermines the democratic governance the people were promised at election time. Though the dog-bites-dog public drama might be more amusing to a people who have little to celebrate as the pledges promised them seem like a mirage in the Gulf desert where Minister Susil Premajayantha was the other day trying to ‘oil’ the palm of the Iranians with promises to pay overdue bills – or perhaps palm the oil – the more insidious for the nation are those who have crept in without the approval of the people and are invidiously planning to grab more power and territory for themselves than the acres they are liberally leasing out to foreigners and dubious investors. But first to the latest “beggar’s opera”. The other day Ravi Karunanayake was chosen as the most noteworthy finance minister in the Asia-Pacific region by the London-based Bankers magazine. If further proof was necessary not to place too much trust in bankers here was clear evidence. Out in this part of the world bankers are fast earning a reputation as lowly as that of politicians and estate agents for hoodwinking the people. The Bankers’ magazine seemed to think that the great Ravi Karunanayake was astute enough to twist the arm of the IMF and get away with the cash – a big loan I mean. Anybody who could do that deserves an accolade, so the bankers’ thought. After all here in one of the foremost financial centres of the world, bankers were only paying themselves huge bonuses out of customer’s money. Politicians do the same, some of it officially like when the Wickremesinghe UNP doles out public money to the elected and selected while preaching about burdensome fiscal deficits. Some call this daylight robbery but that is another story. Anyway this great IMF negotiation surely considered the other way round. It is the IMF that lays down conditions. No acceptance, no tranche big or small. Was Ravi Karunanayake’s tax regime including enhanced VAT one of his parlour games or proposed by the IMF as a necessary condition for the loan to meet the country’s fiscal deficit? I don’t know what Christine Legarde would have said in the Gallic tongue – perhaps merde, merde, merde so appropriate for the occasion. If one asked the Chinese they would have said kowtow or no chow chow. Somebody or the other told me that Karunanayake – another from that ‘scam and scram’ school of learning where the “jobs for the boys” slogan has been elevated to the “jobs for the old boys” motto – had been delirious over the Banker’s magazine selection. Whether true or not I really don’t know but he is said to have told somebody that he is the only finance minister in the world with a CIMA qualification. Now I do not believe that. No, no not that he has not got a CIMA certificate to show the doubting Thomas’s of the world. Why I clearly remember how the foreign minister of the J.R. Jayewardene government A.C.S (All Countries Seen) Hamid did a Houdini act in parliament by pulling out of his brief case the Senior School Certificate of a female who had been posted as a diplomat to our London High Commission, to prove to sceptics that she was indeed an educated person. But at least she had a certificate of sorts. How many of those posted to the London mission or other capitals today could boast of one. What is more I know an MP who has passed the GCE “O” level. It only goes to show that there are educated persons among our parliamentarians and they should not be chided for their lack of knowledge of the quantum theory or Keats’s Ode to a nightingale, though other nightingales they probably know. The aforesaid Mr. Karunanayake proposed the other day that foreigners who bring in US$300,000 would be given temporary resident permits so they could live here an enjoy Sri Lanka’s political comedies, tragedies and farces all for free and pay more for a bottle of katta sambol than they pay in London. They could enjoy whatever dramatic genre that takes their fancy and surely there is much to choose from if you throw in the scams, the tender-benders and the money-making on the side which should lawfully appear in the asset declarations of some of the worthies that claim to be rulers. Before you could say Avant Garde this cleverest finance minister of the Asia-Pacific region who uttered his soothing words and had the foreign sahabs scrambling to get here with packed bags despite a messy airport, his cabinet colleague who dispenses justice – or dispenses with justice as some critics say – rushed in like a bull in a china shop damning the finance chap for sloppy thinking. The reference to china shop is not without point seeing that the Chinese will be setting up shop nearly everywhere if you believe the nostrums of the Wickremesinghe-Samarawickrama combine, and the use of chop sticks will be taught in all state-run schools starting with the duo’s alma mater. Justice Minister Wijeyadasa Rajapakshe claimed that $300,000 as proposed by Karunanayake was really peanuts (sometimes called monkey nuts) resulting in beggars taking up residence in Sri Lanka. What is more, he said, terrorists and drug peddlers would find refuge in Sri Lanka. There is a point in that. After all we have enough drug peddlers living here permanently and if you are not too particular you might even run into some politicians who know a thing or two about drugs and I don’t mean the kind dispensed at Osu Sala. As for terrorists I thought they were going out not coming in, if you believe the Justice Minister. He said in parliament not too long ago that 32 Sri Lankan Muslims had gone to Syria to join ISIS, considered by many to be a vicious terrorist group. His statement was shot down in flames. It was flatly denied by the Security Council (the Sri Lankan one not the one at the UN in New York) and the cabinet spokesman Rajitha Senaratne who can teach the UN a thing or two about issuing statements. So much for the people’s confidence and faith in the remarks of Justice Minister Rajapakshe and his assessment of policies of other minister’s who he openly criticises without putting his own house in order. If Rajapakshe was embarrassed by this public demolition of his claim he showed no signs of it. He continues undeterred and unashamedly now chiding Karunanayake for not bringing it up at cabinet. Had Karunanayake done so, he Rajapakshe would have chewed the cabinet memorandum and its author like chewing the cud. After that extraordinary interlude which beggars (not the ones planning to come) belief people began to ask why ‘Rajapakshe the Intrepid’ did he not wait until it came up before cabinet instead of emulating the bull in the china shop? The public also wants to know whether this is a put up job and Rajapakshe is being used as hit man to shoot down the proposal even before it can be discussed at cabinet. If this is such an attempt whose ploy is it? Rajapakshe claimed that $300,000 amounts to Rs.45 million which is what is paid for a luxury vehicle or two perches of land in Colombo. Ministers and MPs are better acquainted with the price of luxury vehicles for which they get duty-free permits at the expense of the public. Justice Minister Rajapakshe also probably knows more about land prices in Colombo. Those of the moneyed-class, some even with illicit money accumulated over the years who dabble in land for residential and commercial purposes, would know these values unlike most Sri Lankans who find such astronomical prices as unreachable as the stars that shine in the night sky. While Rajapakshe engages in megaphone criticism of his own colleagues, Samarawickrama works behind the scenes, silently and subtly to grant concessions to so-called investors undermining the very rules and regulations laid down by institutions that are specifically mandated to deal with investment issues such as the BOI in order to provide a level playing field. A case in point is the whole stinking business of the Horana tyre factory if media reports can be believed. This is why the likes of Samarawickrama want to bring all the economic policy-making including matters concerning international trade within the ambit of the so-called Development Bill so that they could control all critical issues dealing with the economy apparently shutting the Sirisena-led SLFP out of the loop while making their decisions non-justiciable. The recent case of leasing out BOI land at below the prices set down by the Board of Investment in Horana for the tyre factory mentioned above is bound to rebound on the UNP like the still unresolved bond sale issue eventually bringing the entire government into public opprobrium. If what is said in some media websites is true then the very man that pro-yahapalanaya worthies said before and after the elections is a front man for Mahinda Rajapaksa who actually owns the Dubai Marriot Hotel seems to have now won the confidence of his critics like other business types engaged in political long jumping have done. 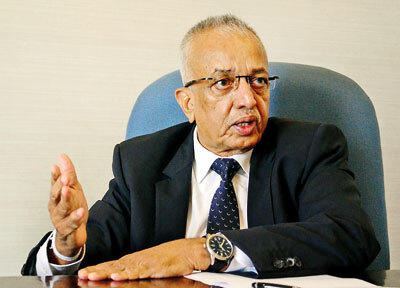 If all that is now said is true Nanda Lokuwithana, the so-called front man has found a point-man in Malik Samarawickrama who is ready to brush aside the BOI rules laid down by the current administration of the institution led by Upul Jayasuriya. Is this not the same Samarawickrama that entered into a pact with a US lobbying firm to ‘sell’ Sri Lanka on the eve of a change of administration in the US when a new White House team was still in the making? Seems like Samarawickrama is following closely in the steps of Sajin Vass Gunawardena and Nivard Cabraal who had no hesitation is doling out state funds to hire US lobbying firms. If this is a development strategy of Samarawickrama the minister of development strategy and international trade, and more are in the offing then only divine intervention might save this country. Why does the Wickremesinghe-Smarawickrama-Samaraweera troika want a US firm to ‘sell’ Sri Lanka when we are doing the job very well on our own?